AssataSAYS.com » Blog Archive » hairfreé for Free! Last week, I was so excited to see I had a package waiting at my door and inside that package were 4 hairfreé brushes! At first I didn’t think there was anything too special about them until I read the instructions and started to play with them. Since my hair is short now, I used the flat brush to help comb through my hair while it was wet and it was easier to get my hair to lay straight than it normally is with brushes and combs I normally use. I didn’t have enough hair in the brush to clean it out but in about a week or two, I’m sure I will. I was hoping Nesha would let me play in her hair this weekend so I could test out the round brush but she went back to school before I had the chance. Here’s the video demonstrating how the the flat brush works. To see exactly how the round brush works, click here. What is the name of the hair salon I used to go to and the name of the hair salon I go to now? The answer to this question can be found right here on AssataSAYS.com. 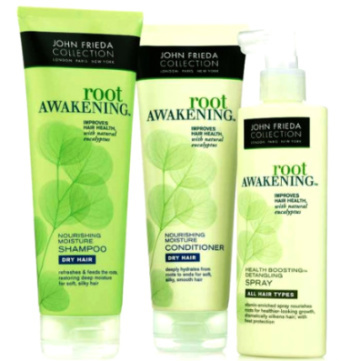 Answer both parts to this question correctly, and you will be entered to win one of 2 gift packages including the round brush or the flat brush along with 2 John Frieda Root Awakening Kits like the one pictured below. I won a few of these kits on ideeli.com for participating in one of their contests. I got so many that I’m giving them to you! Hurry though! This giveaway starts NOW and ends Monday, September 28, 2009 at exactly 9pm. Any entries made after that time will not count. Congratulations to Judy and Lauren! Each of them won a brush and two John Freida Hair Kits! Congratulations ladies!! This entry was posted on Tuesday, September 22nd, 2009 at 9:00 pm	and is filed under SALES AND PROMOTIONS. You can follow any responses to this entry through the RSS 2.0 feed. Both comments and pings are currently closed.